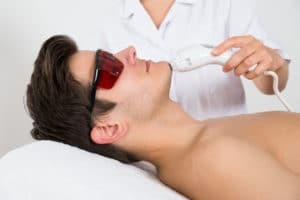 Historically, men have sought cosmetic procedures in relative quiet, while their female counterparts could freely express interest in, and follow-through, with everything from face, lifts to breast procedures. Today, we are seeing a great new trend of openness from men, as well as women, regarding cosmetic procedures. The investment a man makes his appearance is relevant, and this is becoming common knowledge. As it does, men are seeking some treatments, including the following. One of the most popular procedures among men in the last few years has been neck lift surgery. This procedure may focus on lifting and removing skin and superficial tissue on the neck as needed to restore contours under the chin and jaw line. In some situations, liposuction is also incorporated into the procedure to remove excess fat cells quickly and gently. Men who undergo neck surgery not only feel better about their appearance but they also say they are more physically comfortable when wearing shirt-and-tie. Some of the most common age-related cosmetic concerns are also some of the easiest to correct. For men, frown lines or “worry lines” on the forehead are the primary complaint. These lines can often be eased with Botox or dermal fillers. The lunchtime treatments relax muscles between the brows and fill in lines and creases to restore a more youthful (and friendlier) appearance to the upper face. On the male body, it can seem as though hair naturally transplants from one area to another. This can be very disruptive to confidence and also comfort. Men may, at some point, notice unwanted hair growth on the nose, in the ears, or on the shoulders and back. Why live with such a nuisance? Laser hair removal produces long-lasting results over several treatments. However, hair growth is significantly stunted after treatment number one. Non-surgical skin tightening is becoming more popular among younger patients who want to preserve the healthy collagen production they need to support supple, firm skin on the neck, chin, and brows. We offer two forms of non-surgical skin tightening: Ultherapy and EndyMed 3DEEP. Each has been proven safe and effective at restoring and supporting beautiful skin. We welcome adults of all ages to our cosmetic surgery office near Las Vegas to find their ideal treatment plan for facial rejuvenation. Call (702) 684-5502 to schedule your visit with us.